Manuel grew up in Corcoran and he graduated from Corcoran High School in 2009. Shortly after graduation Manuel enlisted in the United States Marine Corps, where he served our nation for 5 years. After serving his country, Manuel moved back to Corcoran and had a strong desire to serve his local community. Manuel has helped coach the track team at Corcoran High School for the last several years while working full time. 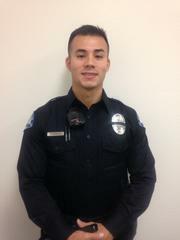 In January 2018 Manuel was hired by the Corcoran Police Department as a Police Cadet and began attending the Tulare-Kings Police Academy. During the police academy Manuel rose to the ranks of Class Leader and graduated from the police academy on November 8, 2018. During the graduation ceremony Manuel was awarded the “Physical Training” award and the 1st annual “Brick” award, which is presented to the cadet who demonstrates selflessness while helping others. Manuel enjoys giving back to his community and is grateful and honored to be part of such a great police department.